Instant downloads of all 946 LitChart PDFs (including A Scandal in Bohemia). Welcome to the LitCharts study guide on Arthur Conan Doyle's A Scandal in Bohemia. Created by the original team behind SparkNotes, LitCharts are the world's best literature guides. A concise biography of Arthur Conan Doyle plus historical and literary context for A Scandal in Bohemia. A quick-reference summary: A Scandal in Bohemia on a single page. In-depth summary and analysis of every Part of A Scandal in Bohemia. Visual theme-tracking, too. 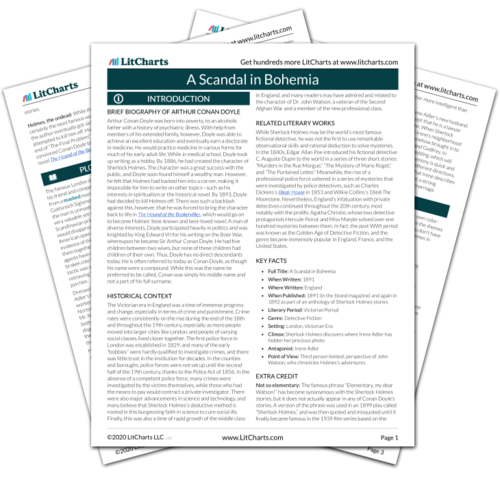 Explanations, analysis, and visualizations of A Scandal in Bohemia's themes. A Scandal in Bohemia's important quotes, sortable by theme, character, or Part. Description, analysis, and timelines for A Scandal in Bohemia's characters. Explanations of A Scandal in Bohemia's symbols, and tracking of where they appear. An interactive data visualization of A Scandal in Bohemia's plot and themes. Arthur Conan Doyle was born into poverty, to an alcoholic father with a history of psychiatric illness. With help from members of his extended family, however, Doyle was able to achieve an excellent education and eventually earn a doctorate in medicine. He would practice medicine in various forms for much of his early adult life. While in medical school, Doyle took up writing as a hobby. By 1886, he had created the character of Sherlock Holmes. The character was a great success with the public, and Doyle soon found himself a wealthy man. However, he felt that Holmes had backed him into a corner, making it impossible for him to write on other topics—such as his interests in spiritualism or the historical novel. By 1893, Doyle had decided to kill Holmes off. There was such a backlash against this, however, that he was forced to bring the character back to life in The Hound of the Baskervilles, which would go on to become Holmes’ best-known and best-loved novel. A man of diverse interests, Doyle participated heavily in politics and was knighted by King Edward VII for his writing on the Boer War, whereupon he became Sir Arthur Conan Doyle. He had five children between two wives, but none of these children had children of their own. Thus, Doyle has no direct descendants today. He is often referred to today as Conan Doyle, as though his name were a compound. While this was the name he preferred to be called, Conan was simply his middle name and not a part of his full surname. Get the entire A Scandal in Bohemia LitChart as a printable PDF. The Victorian era in England was a time of immense progress and change, especially in terms of crime and punishment. Crime rates were consistently on the rise during the end of the 18th and throughout the 19th century, especially as more people moved into larger cities like London, and people of varying social classes lived closer together. The first police force in London was established in 1829, and many of the early “bobbies” were hardly qualified to investigate crimes, and there was little trust in the institution for decades. In the counties and boroughs, police forces were not set up until the second half of the 19th century, thanks to the Police Act of 1856. In the absense of a competent police force, many crimes were investigated by the victims themselves, while those who had the means to pay would contract a private investigator. There were also major advancements in science and technology, and many believe that Sherlock Holmes’s deductive method is rooted in this burgeoning faith in science to cure social ills. Finally, this was also a time of rapid growth of the middle class in England, and many readers may have admired and related to the character of Dr. John Watson, a veteran of the Second Afghan War and a member of the new professional class. While Sherlock Holmes may be the world’s most famous fictional detective, he was not the first to use remarkable observational skills and rational deduction to solve mysteries. In the 1840s, Edgar Allan Poe introduced his fictional detective C. Auguste Dupin to the world in a series of three short stories: “Murders in the Rue Morgue,” “The Mystery of Marie Roget,” and “The Purloined Letter.” Meanwhile, the rise of a professional police force ushered in a series of mysteries that were investigated by police detectives, such as Charles Dickens’s Bleak House in 1853 and Wilkie Collins’s 1868 The Moonstone. Nevertheless, England’s infatuation with private detectives continued throughout the 20th century, most notably with the prolific Agatha Christie, whose two detective protagonists Hercule Poirot and Miss Marple solved over one hundred mysteries between them. In fact, the post WWI period was known as the Golden Age of Detective Fiction, and the genre became immensely popular in England, France, and the United States. Not so elementary: The famous phrase “Elementary, my dear Watson!” has become synonymous with the Sherlock Holmes stories, but it does not actually appear in any of Conan Doyle’s stories. A version of the phrase was used in an 1899 play called “Sherlock Holmes,” and was then quoted and misquoted until it finally became famous in the 1939 film series based on the stories. Holmes, the undead: While the Sherlock Holmes stories are certainly the most famous works by Sir Arthur Conan Doyle, the author eventually got sick of his fictional detective and even attempted to kill him off. Holmes was supposed to die at the end of “The Final Problem” in 1893, but popular demand convinced Conan Doyle to revive him four years later in his novel The Hound of the Baskervilles. Sherriff, Gina. "A Scandal in Bohemia." LitCharts. LitCharts LLC, 15 Nov 2018. Web. 11 Dec 2018. Sherriff, Gina. "A Scandal in Bohemia." LitCharts LLC, November 15, 2018. Retrieved December 11, 2018. https://www.litcharts.com/lit/a-scandal-in-bohemia.